The date is March 26, 2010 and it’s one to remember. J-Hey Kid made it to the majors. Jason Heyward was called into manager Bobby Cox’s office about 8:45 a.m. on Friday morning in Braves camp and told he would be on the Opening Day roster. “I said ‘I’m delighted to tell you that you’re on the team, Jason, simply because it makes us a better team,’” a beaming Cox relayed Friday morning from the Braves dugout. Heyward will be the Braves starting right fielder on Opening Day. 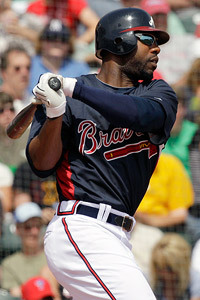 As chipper as Cox sounded, Heyward was just as cool. Heyward automatically makes the Braves a much better team on Opening Day. The Braves outfield last season was one of the worst in the majors when it came to offensive production. Jeff Francoeur was a disaster and shipped up to Flushing Toilet New York and Garrett Anderson was at best a streaky hitter playing his final days of his once distinguished career. With Heyward you get the most highly touted and hyped hitter to come up to the majors since A-Rod and Griffey Jr. As a 20 year old the 2009 Minor League Player of the Year will be expected to produce immediately. This is Bobby Cox's farewell season and the whole Braves organization is hoping to send Bobby off in style by making the playoffs. To make the playoffs the Braves will need to score a lot more runs then they did last season and The J-Hey Kid will be a major reason for or against them making it for the first time since 2005. Either way Opening Day in Atlanta should be exciting. The Lovable Losers come to town in what should be a standing room only crowd at The Ted. The J-Hey Kid Era begins. Now that will put a smile on your face if you are a Bravos fan.